BCA’s latest collaboration with the RSA Academy has seen us work with them on their latest REAL.Project (rigourous. engaging authentic. learning.). REAL.Projects is a design for learning that connects deep subject content with real world problem solving. REAL Projects enable all students to create extraordinary work that matters. Inspired by approaches pioneered in the US, and developed through a partnership between Innovation Unit and High Tech High in California, REAL Projects are now being used by schools all over England. Black Country Atelier (BCA) has supported RSA Tipton in the design, development and production of a Graphic Novel using technology in schools. BCA has worked in partnership with the school to help to plan, develop and deliver teaching materials for the project using digital design and technology. 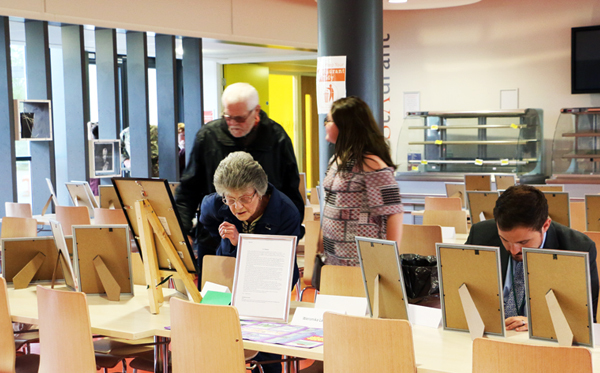 The success of this culminated in an open exhibition of work at the school on the 26th May 2016. 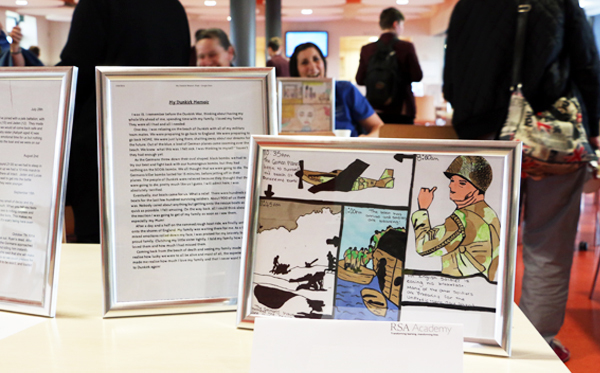 RSA students were given different historical conflicts to research that included WW1, 911 and Hillsborough. Following discussion of the conflicts from different points of view in History and English lessons, the students were tasked with creating a dynamic short story about the conflict that would go onto become the basis of a graphic novel. With specialist digital design and technology input into the development of drawing skills and graphic design, BCA’s Mandy Farmer helped students develop their confidence and skills by visualizing their ideas through technology and design. Through utilising technology in schools, the students learnt how to create storyboards to help them form the initial ideas for the graphic novel pages. By following a series of engaging drawing tutorials, demonstrations and practical’s, specifically in sketch work, illustration, technology and design, the students learnt how to use professional materials, including rendering with markers and the production of cells for the effective layout of the story. The most committed and successful students were then chosen to take part in a series of extension activities with BCA. Within this design and technology class they learnt how to use Adobe Photoshop to create digital versions of their work and develop their ideas. Using industry standard software typically found in schools, the students have been working hard to create professional versions of the Graphic Novel and have benefitted enormously from seeing the improvement in the quality of the work they have been producing. The students have been amazed by the differences between the before and after artwork which they have produced. Moreover, several students have started to think about the possibilities that this new found knowledge and digital design skill opens up for them in terms of future studies and potential careers. We believe that by providing students with professional materials and technology and design relevant teaching and guidance, they are more equipped to succeed. This project has been an interesting and engaging way of developing students in academic and creative ways, challenging them to try new ideas, techniques and working methods. The outcomes have been overwhelmingly positive for all concerned and the participation and collaboration between BCA and RSA Tipton has resulted in a wealth of teaching materials that will be used by the school again for future projects. By working in partnership with the school, BCA has helped to inspire the pupils to achieve more than they thought they were capable of, building confidence, skills and aspirations for the future. This project is part of the Manual for Modern Making, a 3 year programme supported by the Comino Foundation, to raise the impact of modern digital design and making skills in schools.